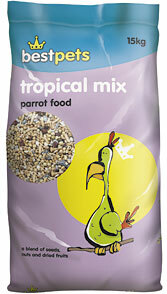 This tropical blend of seeds, nuts and dried fruits makes it ideal for parrots containing a variety of ingredients and piece sizes offering various sources of sugar, protein, fibre and complex carbohydrates for energy. A complementary feed material for parrots. This dark stripe sunflower seed is a high energy food ideal for feeding all birds. It contains high levels of oil and fibre. Sunflower Seed, Oats, Maize, Peanuts in Shell, Extruded Biscuit (Wheat, Wheatfeed, Maize, Soya Oil), Raisins/Sultanas, Flaked Peas, Maize Grits, Dried Banana, Safflorseed, Peanuts, White Pumpkin Seed, Chillies, Yellow Biscuit (Wheat Flour, Colourant).